I found this dress on ebay and I loved it! I wanted to purchase it . The price is $145. I found it on this chinese website but when I saw the real product photo show, it looked similar, but not as nice. The beading looked very much different, as a matter of fact, there wasnt much beading at all, the design looked different and i dont want to order a dress that looks like that. So if anyone knows a website where I can find this dress at( the one on the model) PLEASE give me the website. The reason I wanted a dress for so cheap is because its not my wedding, but mine is next so I have to look like the second bride. 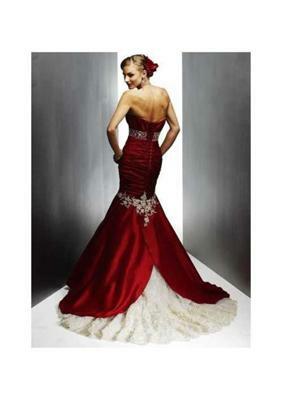 The dress was called "Red Mermaid Dress". Thank you! I am glad you started a new post and sent pictures. I have done a little research since your first post. The gown pictured on the model is by Maggie Sottero and it is called Amara Royale. 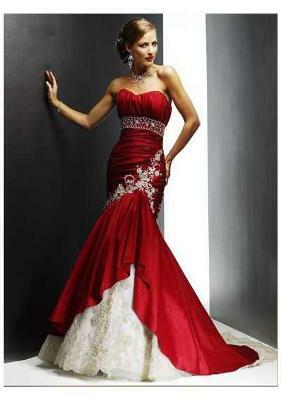 Also another designer made a design that looks very close to that dress is by Mia Solano style number M2715L. The bad thing about this is it appears that both designers no longer make this design and has been discontinued. The only way you can get the dress now is to buy it used, buy a copy or have one made. Search the preowned wedding dress sites for the Maggie Sottero style and Mia Solano style to try and locate the dress used. Here is a list of sites that sell pre-owned wedding dresses. Otherwise, you will have to find someone to recreate the dress for you locally or to take your chances with one of the sites such as the Chinese wedding dress site. I will let you know if I come up with something. Let us know what you end up doing and in the mean time if anyone knows where Anna can get this dress new or used for a good price please let her know. Thank you so much, i really appreciate your help. I will look for the dress on the websites you posted and i will try to find the dress and if i dont, i will see if i can have it custom made. 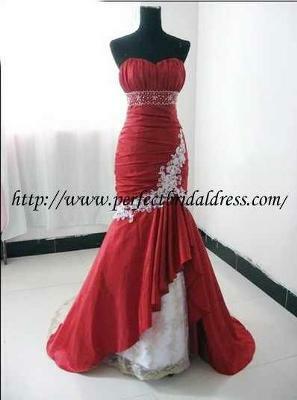 One thing i am sure of is I WILL NOT PURCHASE GOWNS FROM CHINESE WHOLESALERS! I did not like their version of the dress, if anyone knows where i can find this dress used, for a good price, please comment.